Perelandra Soil-less Garden Companion - Perelandra Ltd. It's a beautiful book that's full of all the information you soil-less gardeners have been asking for, and more. It's fun and easy to read. In fact, it's easier than ever to start and have success with a soil-less garden. Those of us on staff who have been working with soil-less gardens for years are already eternally grateful for this book. For those of you wondering, "What is a soil-less garden?" and "What is all the fuss about?" A soil-less garden is how you apply the principles of co-creative science to every aspect of your life: business, education, the arts, the home, research, your job, personal and professional projects and goals . . . all those gardens in life that are not rooted in soil. It's how you work with nature to achieve any goal you wish with extraordinary efficiency and balance. 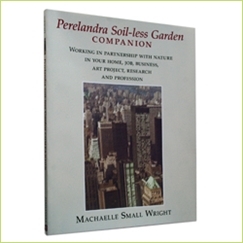 "I have written the Perelandra Soil-less Garden Companion because, quite frankly, those who have been working for years with the Perelandra soil-less garden processes in conjunction with their projects threatened to hit me if I didn't write something. And, after sitting down and looking at what they were complaining about, I had to agree — much to my dismay — that they were absolutely right to complain and threaten me. This Companion is going to make life a lot easier for everyone. "If you are new to the idea of soil-less gardens (SLGs), let me explain what they are. Most likely you think I'm referring to hydroponic gardening. The soil-less gardens I'm referring to are projects and goals such as a business, job, home, classroom, education program, writing a book, delivering a speech . . . For more information on soil-less gardens and why we benefit from working in partnership with nature with this type of garden, read Co-Creative Science and watch the DVD/video, Working with Nature in Soil-less Gardens. "And this brings me to an important point about the Companion. I call it 'companion' for a reason. It's not meant to replace the key soil-less garden information I've previously put out. Rather, it is to be used along with that information. "In the Companion, I centralize important information, include some new SLG processes and update the Soil-less Garden Troubleshooting Process. As I put together the information in the Companion, I took the opportunity to streamline and simplify the SLG Troubleshooting Process and its steps. Along with this, I also introduce a Troubleshooting Process Chart that is specifically designed for the SLG Troubleshooting Process. You 'old timers' are going to love the new simplified balancing and stabilizing steps for each of the energy processes." How to work with "Intents Lists"
If you have steps from other Perelandra SLG material with differing instructions, use the information given in the Companion. The Companion contains the latest and most up-to-date SLG information. Also, the SLG Troubleshooting Process Chart and the streamlined energy processes steps are to be used with soil-less gardens only. Do not use them for Workbook II environmental troubleshooting or for the Microbial Balancing Program troubleshooting. Contains critical SLG information and kinesiology demonstration. Includes the updated information and steps to be used for the SLG Troubleshooting Process. Use in conjunction with the DVD and Troubleshooing Chart. You may download a free copy of this chart here. You can keep all of your records on your computer, or print out blank charts and fill them in by hand. Brochures are included with each new ETS purchase. Perelandra Rose Essences and Rose II Essences are the two required sets for working with soil-less gardens. However, working with all five sets of Perelandra Essences provides more comprehensive coverage. Note: This is not regarding the Perelandra Essences you test for yourself. The Rose Essences and Rose II Essences only refer to the minimum needs for a soil-less garden. The Cards are especially helpful when we need to become "unstuck" and don't know what to do next. This book made all the difference. My first SLG was done before Machaelle wrote The Companion. At that time, I heard in my head, loud & clear, "You're doing it all wrong!" This time was different. I could FEEL my Team listening intently when I talked with them. I asked for a rental home within 6 wks. We worked hard together & the job was completed in 2 wks.! Today my Team had me scouting a particular area for Rent signs for 1 hr. on top of an already scheduled tour. Results: scheduled tour went well, BUT the landlord had promised an out-of-stater 1st pick when he comes in 2 wks., so I was put on hold. One of the Rent signs: "I'll call you in 2 days." 2nd Rent sign: "I'll meet you in 5 minutes." Another great place..2 in one day.., but this one had a Nature twist: the landlord used to teach at my grandsons' school in 1967 -- 650 miles away! Also, she's going out of town for 2 days, time enough to transfer funds to hold my spot. Nature guided me to my best home. Thank you, Nature! This e-book (and its related products) has been a wonderful tool for me to develop projects including building a profitable, healthy, authentic healing practice. The [processes] are very easy to apply (at least once your brain stops wanting to do all the hard work) and make anything related to your business much more fun! on 3/27/2011 Very useful & practical book. Hit the ground running with it! I have this e-book, and find that applying its principles has made me a more conscious creator. It is well-organized, and the processes are easy to use and to adapt to your needs. You'll probably find that over time you internalize the basic principles in it and your relationship to substance & devas will shift. What you will co-create with Nature Intelligence will surprise you and clarify your understanding of your place in the scheme of things. This book will give you practical methods you can apply right now to live life to the fullest.